Two thieves allegedly stole a tradie''s trailer in Clyde North. 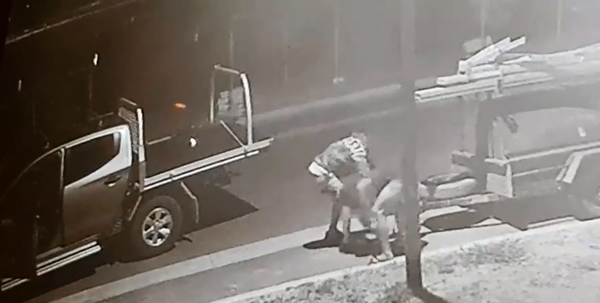 A Clyde North tradie has been left reeling after CCTV captured the moment two brazen thieves allegedly stole his trailer during the early hours of Monday, 14 January. Plasterer Stuart Webster had parked his trailer overnight at the front of his home on Reflections Boulevard. Footage captured two men pulling up in a ute, one carrying what appears to be a pair of bolt cutters as they blatantly approached his trailer about 4.30am. One of the bandits is seen cutting a lock on the tow ball before one wheels the trailer to the ute. It took less than two minutes for the culprits to hook up the trailer and drive off. Mr Webster, 40, took to social media, appealing for anyone with information and to alert others on Facebook’s Casey Crime Page. “I’ve had a good response from the Casey Crime Page,” he said. “People were messaging my inbox – I have been given three names and two addresses which I have forwarded onto police,” he said. The trailer is described as a 6×4 charcoal box trailer, worth $1,500. Mr Webster said it was a huge inconvenience as he lost a day’s work. “I had to go around and get new tools…it was $1,700 and that’s not even everything. “I borrowed a trailer off someone for the time being while I go through the insurance,” he said. Tools taken were a screw gun, T-squares, trestles, planks, stilts, hammers, battery chargers, batteries, and more. Cranbourne Police confirmed the theft and is investigating.